“Vacuum packed” are words every life raft and life vest owner and manager knows, but do we truly know the extent of the impact vacuum packing has on a business? Starting with the basics, “vacuum packed” refers to the inflatable being packed in an airtight container or bag under low pressure in order to preserve the equipment, preventing corrosion and more. For simplification purposes, this paper will focus on the packing of life rafts as its main example. This will illustrate the benefits of vacuum packing and detail how it works. Do take note, however, that other products can benefit from vacuum packing, such as a life vest. Through vacuum packing technologies, EAM (Easterm Aero Marine) has developed a 10 years life jacket, meaning it requires no maintenance for that period of time. Vacuum packing a raft… or any other product, for that matter, reduces its size. Air, even in a deflated life raft, takes a lot of space and contributes to the expansion of flexible material. This limits storage options for a life raft, especially those that are larger. Vacuum packing can reduce the size of a life raft by over 40%. In addition, the shape in which the raft is compacted can be slightly modified. Smaller rafts (1, 4, 6, 10 man rafts) can be packed into ‘wedges’, making them ideal for storage under a seat. Square packaging simplifies storage of the raft into a hard case valise. 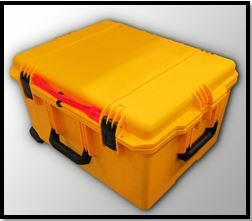 Special valises can help ease storage as well, making it deal to store a raft with its survival equipment. These are available on the market in the forms of hard case or soft valises of various shapes & sizes. The compact solution provided by vacuum packing is significant in many ventures. Take for example smaller aircrafts, like a search and rescue helicopter. It needs all the space it can to provide a safe zone for the people it rescues, the material it needs to operate its first response duties and for the rescue staff to occupy. This gets quickly hindered by the presence of large bulky life rafts loosely packed that can take the space of an entire seat. Vacuum packing would allow to place it in a compact hard case valise stored low, freeing a lot of space. Life rafts are considered an expensive piece of equipment ranging from a few thousands of dollars for a small raft (1 to 6man raft) to well over $10,000.00 for some of the larger rafts. Its cost does not end with the initial purchase: rafts need to follow a maintenance cycle in order to guarantee their performance if an emergency should arise. This cycle is provided by the raft’s manufacturer, usually recommending to have the raft inspected and overhauled every year. This implies shipping fees, the costs of the inspection, the possible cost of repairs and replacement parts and repacking. Not only is there a financial cost linked to the regular maintenance of a life raft, but there is also a significant cost of time and convenience. Each maintenance requires time for the shipping, overview and paperwork related to the maintenance. As for convenience, the few days required for the inspection (longer if shipping to a center far away) leave the raft owner without a raft, meaning the aircraft normally carrying the raft is either not air worthy for that period of time, or needs a temporary replacement. When a life raft is vacuum packed, the maintenance cycle can easily be extended to a 3 year interval. Over a period of 15 years, that is 10 inspections less! This means a reduction in long term costs, more time that can be sourced to other work and the convenience of keeping the raft on board the aircraft instead of sending it off for maintenance. It is important to note that different life rafts OEM will have different packing methods recommended in their user manuals & guidelines. Winslow, for example, is one of the OEM that requires vacuum packing after inspection. 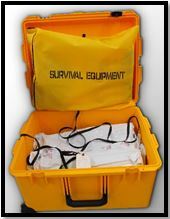 Now one might notice that accompanying survival equipment will still require replacing or more frequent maintenance, but this is easily solved by keeping the equipment separated. 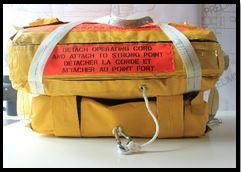 Special packing options are available to keep the survival equipment separated but still attached, so that if the raft was to be deployed, the equipment would remain easily accessible on board the raft. For example, Tulmar offers soft packs attached to the raft by a strap and packed in a hard case valise, or a two parts valise with both parts attached together. All that needs to be done then is to remove the survival equipment requiring maintenance or replacement without having to handle the raft at all; simple and easy. What are the deterioration risks? A life raft regularly stored risks exposure to various elements. This potential exposure can be detailed as air, moisture and temperature. Fabric and parts exposed to air, especially during hot and dry periods, can become dry and brittle, leading to fabric deteriorations. 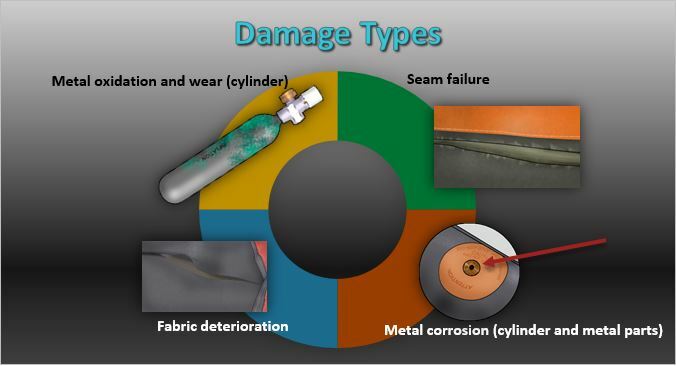 The same can be said about friction of the material, resulting from exposure to the aircraft’s vibration during a flight, thus damaging the elastomeric fabric and various components. The raft owners / users will begin to see cracks, porousness, discoloration and maybe even tears in the fabric. Seams are more vulnerable, having more diverse material where the adhesive or thread can fail due to drying or losing some of their adhesive property through exposure. Metal parts, including the inflation cylinders, are also at risk of rusting or oxidizing when exposed to moisture in the air. All the potential damage reduces the integrity of the raft and its components, resulting in costs for repairs, replacement parts and in worse case scenarios, the need to replace the raft as a whole. To mitigate these damages, manufacturers must recommend a yearly maintenance of the raft. Vacuum packing creates a barrier between the life raft and these elements by providing an air sealed environment for the raft. This is valid for initial packing of the raft and is a solution that must remain ongoing to gain optimal results. This means repacking after each inspection or after usage. The upside is, because the vacuum pack provides a controlled environment and a barrier between the rafts and damaging agents, the interval of inspection can be increased. Deterioration in a vacuum pack is much slower than if packed in a regular bag or pack. This permits the OEM to confidently recommend a 3 year interval for vacuum packed rafts, reducing maintenance by one third! With deterioration reduction also comes a potential reduction in parts requiring replacement or repairs. Winslow and Tulmar are two example of this, recommending maintenance every 3 years instead of every year due to vacuum packing. The following numbers are based on 2017 price lists and are associated to a 6man life raft maintained following the exact manufacturer’s guidelines. The numbers below are per life raft over a period of 15 years. For aircrafts carrying life rafts through rough conditions (harsh weathers, dusty or humid terrains), exposure to the elements is even greater, thus risking additional deterioration of the raft, resulting in higher cost for repairs and parts. Even when buying used rafts, the savings vacuum packing offer are considerable in the long term. The cost of a regular inspection and overhaul for a life raft, based on 2017 prices, is an average of $300.00 plus a repacking fee of $500.00. For this example, we will add a $200.00 shipping fee, something that will vary according to the distance between the life raft’s point of sending and the approved center where it is overhauled. 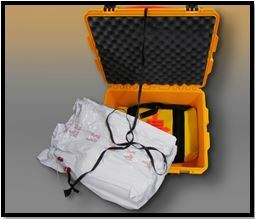 When regularly repacked, a life raft needs to be inspected annually. This means 15 inspections at $1,000.00 each time over the course of a 15 years period, resulting in a total maintenance fee of $15,000.00. There is commonly additional expenses for parts and repairs over such an extended period, more so near the end of the 15 year period as the raft gains in age. For this example, we will limit this to parts directly linked to the raft and exclude costs related to replacement of survival equipment (such as expired food items or flares). Common repairs will involve seam re-enforcement, patches, replacing valves and the likes. For this example we will use an estimated average based on historical data – $2,000.00. 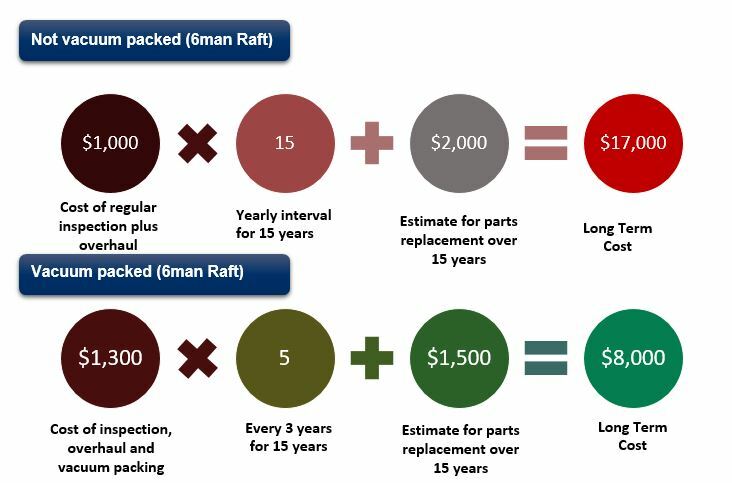 The total maintenance fee for a 6man raft over 15 years amounts to $17,000.00. Now let’s review this same scenario but with the life raft being vacuum packed. Note that the results are only applicable if the raft is vacuum packed after EACH inspection. The fee for shipping and inspection remains the same, a total of $500.00. Vacuum packing will commonly add up to $300.00, for a total of $800.00 in packing fees. Now according to the User Manual, when vacuum packed, a raft can extend its inspection period to every 3 years instead of every year. This is one third of the inspection number required if using regular repacking! This means 5 inspections at $1,300.00 each over the course of a 15 years period resulting in a total maintenance fee of $6,500.00. Add in an estimate of $1,500.00 for replacement parts and repairs, which is lower as vacuum packing results in less and slower deterioration, meaning less repairs. The grand total of a vacuum packed 6man life raft for a period of 15 years is $8,000.00 – A reduction of approximately HALF in total life cycle costs! Vacuum packing is delicate work and requires high attention to detail. If not careful, it would be possible for the process to damage the raft as opposed to protect it. This is why it is important to send your raft to professional center geared with specially trained staff. Tulmar offers this service to life raft owners, ensuring rigorous inspections, quality repairs and timely service. To get a life raft serviced, go to www.tulmar.com.